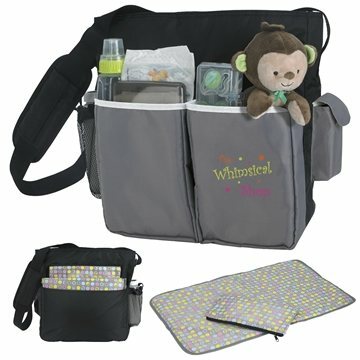 This modern diaper bag is a perfect fit for men and women! The neutral color is ideal for any baby gender and the back pocket is great to insert the changing pad for easy diaper change. Includes changing pad and mini bag exclusive design. Five exterior pockets (one in the back) and interior pockets for easy organization. We ddn't have time to ask for a free sample but the final products turned out great! I like the shape of them I was ordering the square ones. I like the deviders in this one. Rosa was awesome to work with! She paid close attention to every detail, was very responsive to our needs and helped us meet a critical deadline. Great job Rosa!! It was a very nice product. there is no 'least' in connection with this product, service, delivery It was all first class all the way. the printing clarity is great! I liked the design and overal product.